Founded in 1984, National Retail Properties (NNN) is one of America's oldest triple net lease, or NNN, REITs. The company follows a "sale-leaseback" model in which it will buy a property from an existing tenant and then rent the property back to the former owner under long-term (15 to 20-year) contracts. The average remaining lease term is 11.4 years, and just 5% of leases expire through the end of 2020. Triple net lease contracts require the tenant to pay for insurance, maintenance, utilities, and property taxes. National Retail Properties thus serves purely as a landlord, collecting a recurring stream of rent from which it pays its steadily growing dividend. These leases also have annual rental escalators built in (about 1.5% a year) that are based on a formula partially indexed to inflation. National Retail owns over 2,800 properties in 48 states, leased to more than 400 tenants in 37 industries. Its largest concentration is in convenience stores (18.8% of rent) and experiential industries such as restaurants, entertainment centers, health clubs, auto service shops, and theaters. The REIT is also well diversified by region (Southeast accounts for 27.1% of rent, followed by the Midwest at 24.7% and the South at 22.8%) to minimize the potential impact from an economic downturn in any part of the country. National Retail has paid rising dividends for 29 consecutive years, the third longest streak of all public REITs and longer than 99% of public companies. To be a suitable dividend stock for conservative income investors, REITs such as National Retail Properties rely on three main factors to generate safe and rising payouts. The first is a predictable business model, characterized by a highly diversified portfolio of properties leased out to financially strong tenants. For example, National Retail's top 25 tenants generate just 58% of its annual rent, and no single company represents more than 5.5% of its annual revenue. More importantly, the weighted average rental coverage for its largest customers is very high, with an operational cash flow-to-rent ratio of 3.6. That's among the highest rent coverage ratios in the industry and suggests most tenants could continue honoring their lease contracts even if they fell on hard times. Even after all fixed costs are factored in, meaning maintenance, insurance, taxes, and other overhead costs, the cash flow of National Retail's average top tenant is 2.3 times greater than the rent they pay. 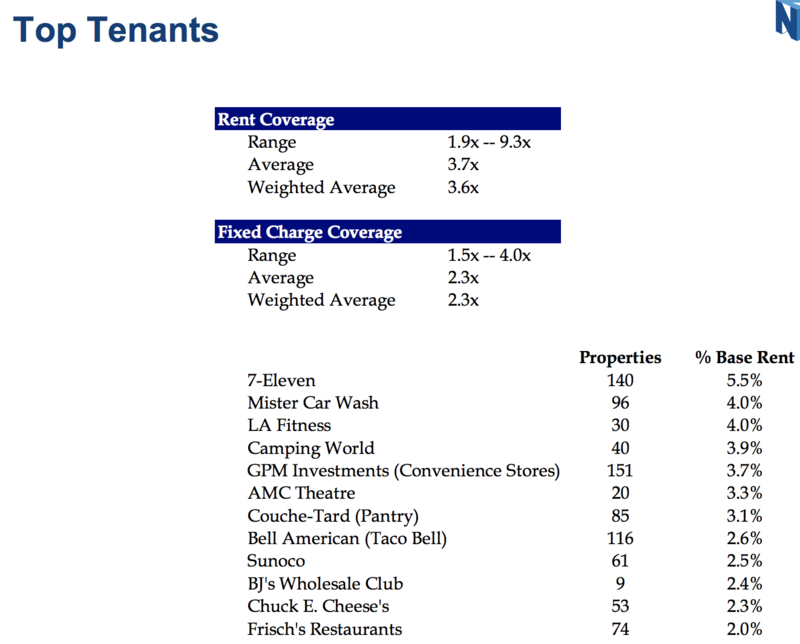 These rental coverage ratios have generally been stable over time, indicating that the firm's tenants are not suffering nearly as much as other retail industries, such as malls and department stores. 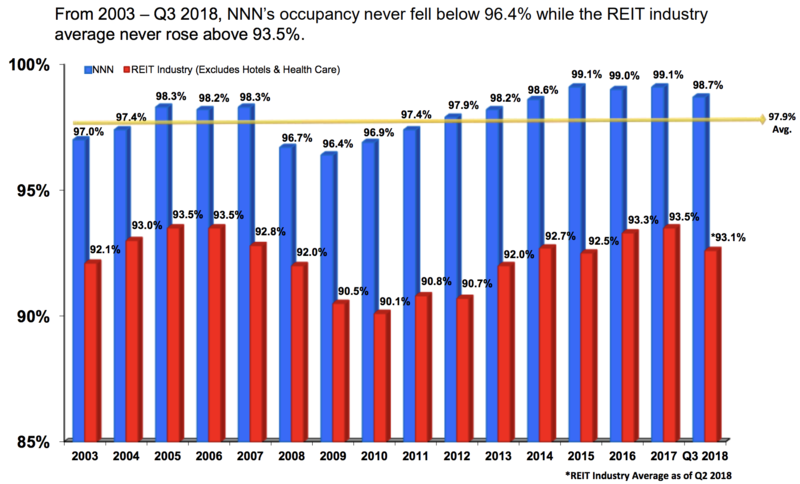 As a result, National Retail Property's occupancy (currently close to 99%) has never fallen below 96.4% in the past 15 years and has remained far greater than that of the average REIT's over time. The second important factor for REIT investors to evaluate is the quality of a firm's management team. These are the people making the long-term capital allocation decisions that allow a REIT to profitably grow, and thus make sustainable dividend increases possible. In the case of National Retail, the top six executives have an average of 18 years with the REIT, and the average employee has worked at National Retail for 10 years. As a result, management has developed many industry connections, including an ability to source new acquisitions from private parties rather than public markets. 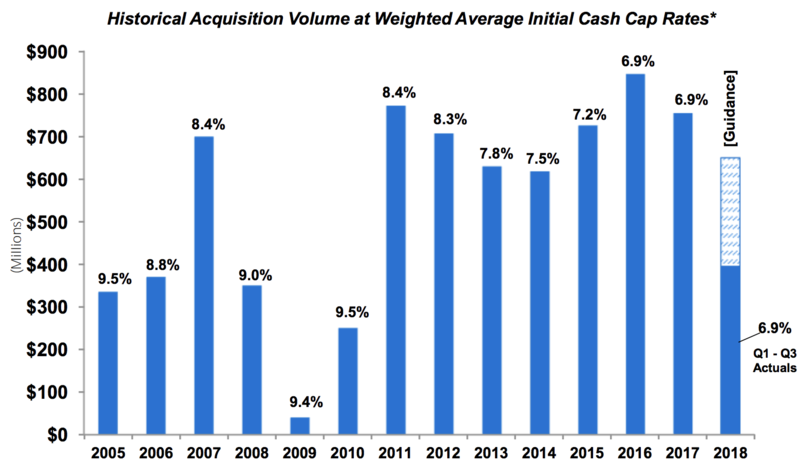 Private transactions (71% of the company's historical deals) are more profitable, with an average cap rate of 7.7% compared to 7.3% for publicly-listed acquisitions. What's more, these private market transaction tend to also have higher annual rental agreements baked into their leases. However, one of the most important concepts for REIT investors to understand is the cost of capital and its effect on a REIT's growth prospects. Remember that REITs by law must distribute 90% of taxable income as dividends. As a result, REITs pay out the majority of their cash flow and have little left to fund new property acquisitions. That's why almost all REITs frequently tap the debt and equity markets for growth capital by borrowing debt and selling new shares. In order for a REIT to grow profitably, its weighted average cost of capital must be below the cash yield it earns on new properties, which was about 7% for National Retail Properties in recent years. The company's higher than average cap rates are not just due to management sourcing a lot of its deals privately, but also the REIT's underlying business model. Specifically, National Retail Properties is interested only in free-standing properties, which have no anchor risk (unlike shopping centers or malls). By owning single-tenant properties, tenants are unable to pool their bargaining power together to try and reduce their rent. National Retail’s main street locations also provide a strong market for replacement tenants and rent growth over time. In addition, management mostly rents to tenants who do not have investment grade credit ratings, which allows for better pricing and rent growth. Their lack of ratings doesn't necessarily mean that these are riskier customers since many smaller businesses won't pay the steep fees charged by the ratings agencies. 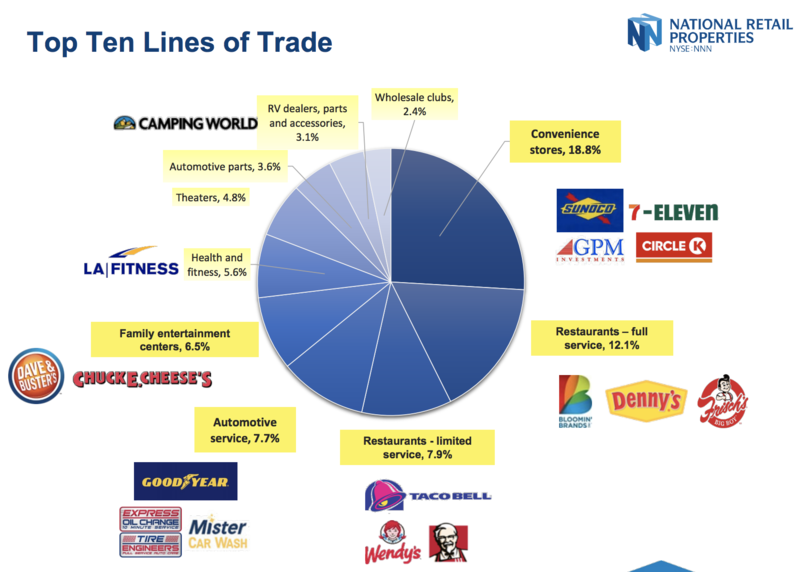 What National Retail focuses on instead is partnering with strong businesses in good markets, with solid fundamentals. Since each tenant's business is highly localized (to that specific high traffic area), most tenants are unlikely to move stores and risk losing customers when it comes time to renegotiate a lease. To put it another way, consumer-focused retailers often face more switching costs than an office or industrial customer because they are more location-driven; they don’t want to risk disrupting their established customer base to save a bit on rent, resulting in stronger renewal rates. This is why over the past decade National Retail Properties has averaged an 84% lease retention rate, and new leases have been on average 2% higher than old ones for the last three years. In other words, National Retail's tenant base not only appears to be doing quite well, but it is largely locked into the company's properties. As a result, they are more willing to pay higher rents (with annual escalators tied to inflation) and thus provide the REIT with solid cash flow predictability. While earning a healthy cash cap rate on its properties is very important, the final competitive advantage National Retail has is on the cost of capital side of the equation. Thanks to its conservative balance sheet, created by below average leverage (see below), the REIT has a BBB+ credit rating with a stable outlook from S&P. This helps the company borrow very cheaply, at a 4.1% average interest rate, and less than 3% of its debt matures through 2022. Simply put, management runs the business with a very conservative balance sheet, supporting the REIT's dividend safety in goods time and bad. In addition to cheap debt, National Retail Properties typically enjoys a lower cost of equity (as represented by AFFO yield on new shares) than most of its rivals. The company's impressive track record of creating value for shareholders (12%+ annual returns over the last 25 years) and paying higher dividends for 29 consecutive years has resulted in a stock price with relatively low volatility and a premium multiple. Therefore, National Retail can more easily raise growth capital by periodically issuing new shares. Thanks to National Retail's low financing costs and healthy cap rates, the firm enjoys a wide range of potential growth opportunities. The total size of the single-tenant retail property market is estimated to be in the $1 trillion range, but the company's total assets are just $7.6 billion, providing plenty of room for future growth via acquisitions. The retail property market is extremely fragmented as well (most of the company’s properties are $2 million to $4 million in size), resulting in less buyer competition because it’s harder to scale in this market. Overall, National Retail Properties' combination of a cash-rich business model, a conservative management team, above-average profitability, a well-diversified portfolio, and one of the best dividend growth records in the real estate sector appear to make it a solid long-term company. There are three main risks to consider before investing in National Retail Properties. First, the retail environment is seeing meaningful disruption thanks to the increasing popularity of online retailers such as Amazon (AMZN). In fact, in 2017 Credit Suisse estimated that 20% to 25% of U.S. shopping malls (220 to 275 locations) could close by 2022. National Retail Properties has done a good job in terms of "Amazon-proofing" itself thus far, thanks to its focus on single occupancy properties, which are rented out to convenience and experience-oriented tenants. However, there is a risk that even some of these tenants might eventually come under pressure, as Amazon plans to eventually offer perks such as free two-hour delivery for its Prime members, further increasing its convenience appeal. In addition, some of National Retail's properties can be specialized, such as gyms, banks, or movie theaters. This means that should a tenant fail (or not renew it lease), finding a new tenant may not be easy or could require expensive redevelopment costs. 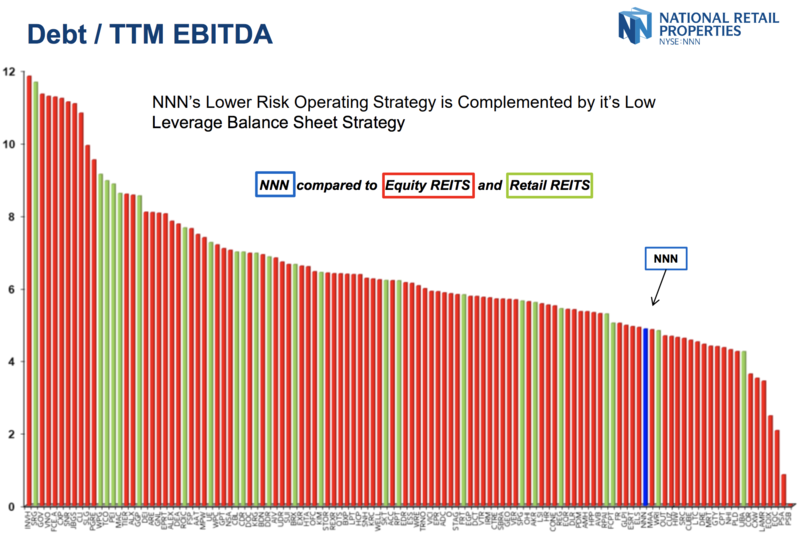 This is why triple net lease REITs such as National Retail generally turnover some of their properties each year. Since vacant properties generate no rent and also require the REIT to pay for maintenance, taxes, and insurance, it often makes more sense to just sell the property than let it be a drain on the REIT's finances. However, if future retail disruption does become severe enough, then even though National Retail can adapt its portfolio over time to growing industries, the rate of new net property growth (and thus cash flow share growth) might slow. That, in turn, could result in slower dividend increases than what investors are used to (about 4% long-term payout growth). For now, management expects to continue delivering 4% to 6% annual longer-term AFFO per share growth. Over the past 20 years National Retail has delivered 4% annual AFFO per share growth, so this target does not seem unreasonable. If successful, the dividend should continue growing at a similar pace. Besides potential disruption from e-commerce, it's worth repeating that many of National Retail’s tenants are non-investment grade businesses, which are riskier than investment grade tenants in the event of a recession. Management targets this group because it allows for better pricing and rent growth. The company also believes that tenant credit ratings can be a fleeting factor, and there is always room for tenant credit improvement. Fortunately, National Retail’s results during the last recession (87% of prior leases were renewed in 2009 and 101% in 2010), the company's consistently high occupancy rates, the REIT's conservative balance sheet, and the fact that over half of National Retail’s rent is from public companies of those with rated debt reduce some of the concerns here. While most retail tenants will be impacted by an economic downturn, National Retail’s industry diversification provides some protection as well. For example, convenience stores (its largest industry exposure) would likely perform relatively well during the next recession. Another risk factor is one that seems initially counterintuitive. REITs usually do best in a strong economy, because tenants that are thriving can afford higher rents (one reason why REITs can actually be a good long-term hedge against inflation). However, during long periods of prolonged economic expansion, property prices can rise, meaning that cash yields (cap rates) decline. In other words, new investments can become less profitable, and thus make it harder to grow adjusted funds from operations (AFFO) per share (and dividends) as quickly. For example, in the chart below you can see that cap rates usually fall as the economic cycle ages, resetting to higher levels during a recession. The length of the current expansion has caused cap rates to decline from 9.5% in 2010 to 6.9% in 2018. Since National Retail has a very disciplined approach to acquisitions, the company might not be able to find enough profitable deals to keep up its recent growth rate. Management's initial 2019 guidance calls for about 5% AFFO per share growth, so it appears to be business as usual for now. Overall, management’s conservatism reduces most of the diversifiable risk the company faces. It seems unlikely that any one industry, customer, or geography could permanently impair the company’s long-term earnings potential or jeopardize its dividend. Many triple net lease REITs enjoy a business model that is capable of delivering safe and growing dividends, and National Retail Properties is no exception. The company has proven itself to be among the best in its industry thanks to its conservative management team, strong balance sheet, mostly e-commerce proof tenant base, meaningful diversification, and ability to grow its payout in just about any economic and interest rate environment. Therefore, National Retail Properties seems like a reasonable candidate to consider as part of a well-diversified retirement portfolio.